When you're camping with kids, you have to keep them entertained -- or else. This is especially true when camping out with teenage boys. They have unlimited energy and the attention span of a hummingbird. If you let two teenagers get bored, fighting ensues. It's a law of nature. There was a time when bicycling and rollerblading around the camp loops took care of the energy and boredom issues. If the campground had a nice little store where we could buy some ice cream, that was good enough. 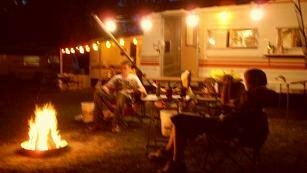 Those days rest peacefully in our camping past. These days, we seek out camping resorts with lots of available activities. Most offer swimming, miniature golf, and some sort of arcade. Several have fishing ponds or streams. We bring our croquet set so the whole family can compete in something at least mildly athletic. In case of rain, we always have games we can play under the awning. With a bit of planning, you can find even more interesting things to do on your next camping trip. 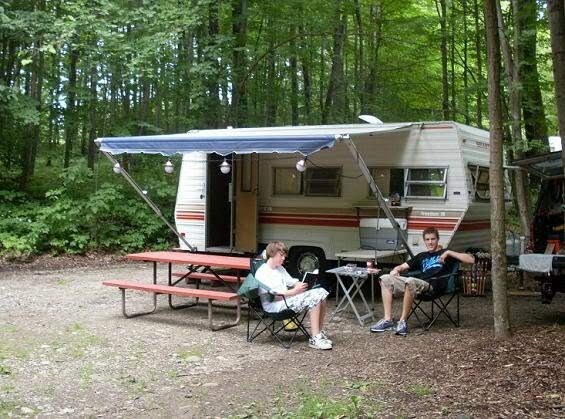 Campground websites usually offer "nearby attractions." We had hoped to go kayaking, one way or another, and finally took the plunge (literally!) this summer. If you find a vacation spot with a stream or canal nearby, chances are you can rent kayaks by the hour. Turns out that we didn't have to look too far to find kayak rentals here. We didn't even have to book a campsite. 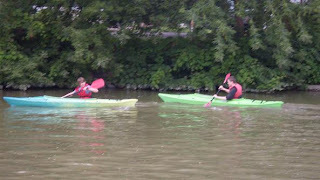 Our kayak outing took place in downtown Fairport, right on the Erie Canal -- about four miles from our front door. For less than $50, we three boys rented kayaks, got a few quick pointers, and spent an afternoon wearing ourselves out. Lesson One: Leave your valuables in the car! If you've never piloted a kayak (we hadn't), consider the possibility that you might end up in the drink. 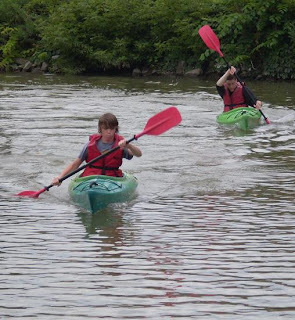 After we spent a few minutes paddling around and getting used to the feel of these little watercraft, we decided to organize a game of Kayak Tag. We chose a wide spot on the canal, set end boundaries (dock to dock), and the chase was on. After a few close calls and much laughing and taunting, we had our first victim. My youngest overturned his kayak and found himself treading water. His boat took on some water and ended up partially submerged. Lesson Two: Kayaks do not "flip back up" by themselves! We had basic open kayaks, not the kind you see in white water videos. These little boats are perfectly capable of sinking, if you aren't careful. 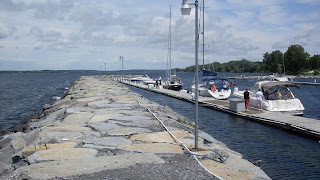 Fortunately, we were only a few yards from one of the two docks. After some shouted instructions from our friendly boat rental guy (on the other shore), we were back on the water. Less than twenty minutes later, the canal claimed its second victim -- my oldest son. Luckily, he'd left his cash and Blackberry in the truck. He also managed to right his kayak without too muich flooding. We learn from experience. Two out of three was enough. With two of us soaked to the skin, that left only me unscathed. I had money and my cell phone in my pockets, and I was getting worried. For one thing, I'm the least coordinated of the three of us. It occurred to me that both boys would have loved to see their dad in the water. I checked my watch (yes, I'm a glutton for potential disaster), and saw that our time was nearly up. We had already secured an extra half hour, after our first man overboard. Not that my clothing wasn't soaked from splashing; but my valuables were intact. We had tempted the fates long enough. We were exhausted, too. Kayaking is hard work! We pointed our rented boats back to the launching dock, took time for a few pictures, and called it a day. I have to say, it was a very good day. We had tried something new, spent an afternoon together, and burned off a few hundred calories in the process. Just Camping Out was recently featured on the Zone, Helium.com Writers who also Blog. I'm honored to be included there, and always happy to offer guest postings for my readers. Some of our most-read posts are from guest authors. If you'd like to be considered for a feature here, you can reach me via Comments or by using the link at the top of this page. 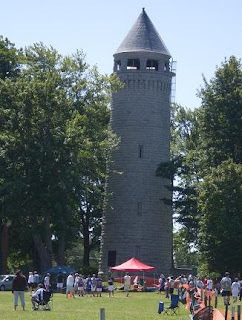 Every summer Sackets Harbor hosts the 1812 Shoot Out Lacrosse Tournament at the Battlefield State Historic site on the shores of Lake Ontario. Teams from all over western New York compete for trophies in several age brackets. My youngest played four games this past Sunday for the Canandaigua Braves. It's a long drive for us, over 100 miles, so we like to arrive a day in advance and camp out at nearby Bedford Creek Campground. While the younger kids were meeting on the Battlefield on Saturday (and dodging thunderstorms), we were en route under threatening skies. Halfway there we found ourselves on unfamiliar roads with lightning all around us and heavy rains slashing our truck and trailer. The shoulder was narrow and visibility was minimal, so we crept along until we reached a gas station on the main road near Oswego. We had visions of a washed out camping trip, but the sky eventually cleared. Our campsite was swampy but acceptable, and we didn't get stuck as we maneuvered our camper trailer into a tight spot, perfectly level -- fortunately! Minutes later, our team's coaches arrived to claim the spot right next to us, a nice surprise. The thunder and lightning returned briefly as the sun set, but that was the last of the bad weather. Bedford Creek is a pleasantly crowded, inexpensive private campground. Amenities include a nice little camp store, a small marina, a nearby pizza shop and golf course. 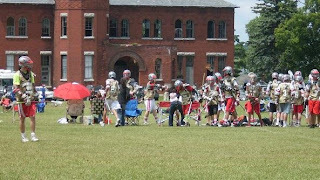 Most of the sites are occupied all season, but there's plenty of room for lacrosse families. Sites are available for everything from Class A motorhomes to tents, and include water and electric. Sunday dawned sunny and breezy. Perfect lacrosse weather. We buttoned down our camp and headed for the battlefield site. My son's team won half its games, placing fifth overall in his division. Before we left we bought commemorative tee-shirts and drove downtown to the waterfront for a tasty late lunch. With the campground just minutes from the tournament site, we enjoyed a relaxing weekend. Although it never got hot, my boys both decided to brave the frigid lake waters for a swim before we broke camp on Monday. They couldn't resist. The trip back was uneventful, and we happy to return relaxed and well-rested. Camping out is a great way to attend away games! How about you? Do you have a camping outing you'd like to share? If you have a few pictures, that's even better. If you'd like to submit your outing for posting, you can reach me via Comments or by using the link at the top of this page. Connect Four is fun for all campers, young and old. Taking the kids on a camping excursion means you have to keep them entertained, too. Over the years we've found a few games ideally suited to the rigors of the campground. One of our favorites is Connect Four, from Milton Bradley [retail price, $19.99]. 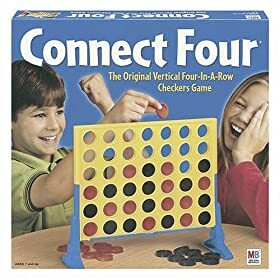 Connect Four is billed as "the vertical four-in-a-row checkers game," and looks like an upright version of Tic-Tac-Toe. This game is neither checkers nor the classically unwinnable kid's pastime game. In fact, Amazon.com rates it four stars out of five, and we agree wholeheartedly. Players can indeed win this game; it provides a serious challenge to strategists who can see a few moves ahead. The game "board" is an upright enclosure that accepts traditional checkers pieces in sequence. It's seven slots wide and six spaces tall. The object of the game, quite obviously, is to "connect four" of your red or black chips -- vertically, horizontally, or diagonally. Since red and black alternate play, you have to plan ahead to set up unstoppable combinations while keeping a watchful eye on your opponent's moves. We've seen many games lost by a player who forgot to play defense as he plotted his offense. What makes Connect Four such a good choice for camping? 1. It's waterproof. A sudden rainstorm won't hurt this game one bit. Believe me, this matters! 2. It's wind-proof, too. Trying to play card games or Monopoly at the campground can be frustrating if there's the slightest breeze. Even if a sudden gust topples the game board, you can stand it right back up and continue playing. 3. No batteries or power cord required. This should probably be listed as reason number one! 3. Campers of all ages and skill level can learn to play in just minutes. You won't need an instruction sheet. New friends from the campsite next to you can join right in without hours of initiation. 4. It's far more challenging than it first appears. How many times have you heard that timeless whine, "I'm bored"? That's why we play games while camping, in the first place. Finding an easy game that doesn't "get old" in minutes is a big win-win for kids and parents alike. 5. Individual matches are over quickly. Some games last less than a minute; others take as much as five, but rarely longer. Players can come and go, yelling "I play winner" as they switch between this game and other activities. We like to hold Connect Four tournaments.